My pal Brian Baxter emailed the other day to ask whether Ben and I fancied joining him and his son for an early morning session. I was keen to go and we arrived in the car park just before 06.00hr. There was a bit of wind from the North (offshore) so we were all raring to go. Young jamie was hoping that there might be some more squid about and had been devising ways to try and get one in the net. Disappointment!!!! When we got down to the clifftop we found a huge swell rolling in and washing over the ledges that we wanted to stand on. It was clearly too risky to fish and we had no real alternative venue so it was time for the proverbial early bath. We were all gutted. I decided to try another stretch of shoreline on the following day (Sunday). This was on a beach within the Army firing range which is usually open at weekends so I didn't bother to check. As I drove past the notice at 05.45 I could see the word CLOSED - clearly it just wasn't going to be my weekend. I knew that it would be possible to fish a shorter section just outside the closed area so I pressed on, reluctant to return home for a second time. When I got to the shore the tide was in and the sea was flat, although the big swell of the previous day was still rolling in. 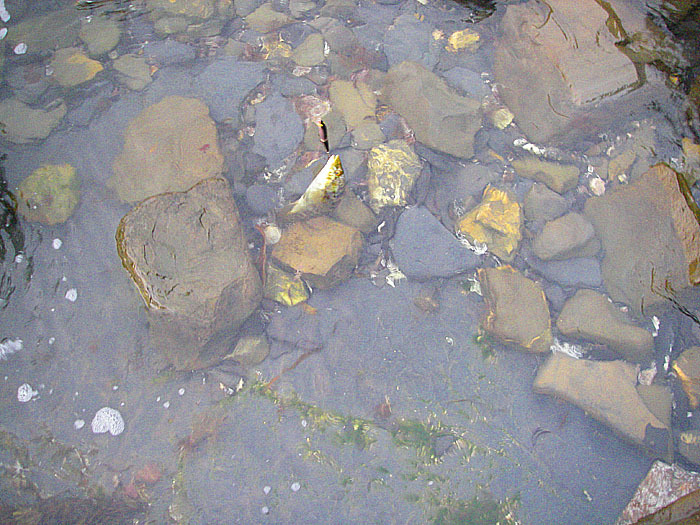 This particular beach was not dangerous so I tied on a TD pencil surface lure and began to fish. After and hour or so and a good mile of shoreline I'd had no bites. All I'd seen were a couple of garfish jumping. The conditions looked good and I was a bit cheesed off. 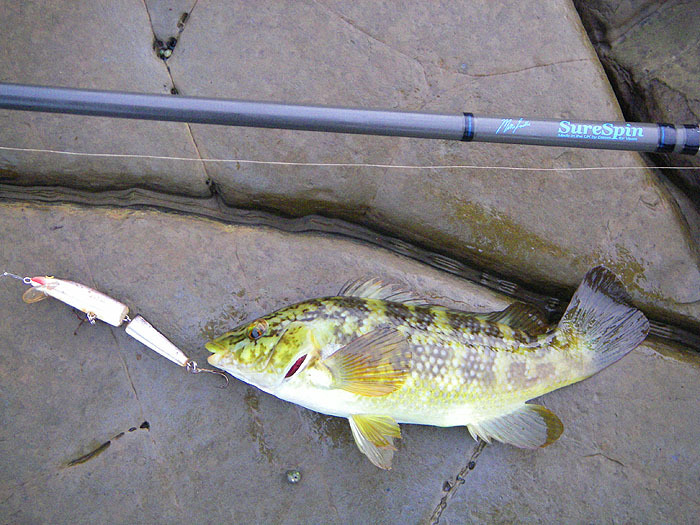 I decided to tie on a J11 Rapala and see whether I could catch a wrasse (with a chance of a bass of course). It was only about five minutes later, as I retrieved over a shallow bed of wrack, that I felt the tell tale tug on the plug and found myself playing a modest ballan. I landed the fish and took a few pictures then began to cast again. Another five minutes and another bite which I missed concluded operations for the morning. At least it wasn't a total blank.